Ty Ziskis outside of Brain Freeze. 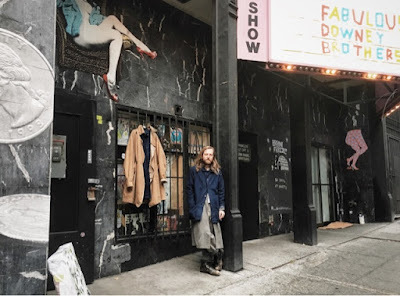 Go see this insanely creative space downtown in the old Lusty Lady across from the Seattle Art Museum where Ty has his beautiful clothing line Zed (worn by Ty in this photo) for sale as well as other amazing clothing and artwork. This pop up gallery won't be around forever so stop by while you can Weds-Sats 12-6.